Today we will add to the lonely letter O, and I hope you’ll be pleasantly surprised what an easy step it is. This is because beautiful lettering has common shapes repeated within it, and the shapes you’ve learnt so far crop up many many times, making all our italic letters feel related to each other. When we learn an alphabet, it’s actually easier to learn the letters in groups that share shapes, rather than starting at A and working through to Z. So this sheet provides the double boxes (with an O drawn in) for the letters in families based on O, based on U and based on N. Then there is a set with strong diagonal strokes, and finally letter S! You can either print this out and write on it, or print it out and use it under your writing paper as a guide. Or of course you can draw your own boxes. Let’s look at the first family – the O family. You already know how to do O (remembering to start at point A - or 11 o’clock if we think of it as a clockface). For C and E you also start at 11 o’clock. Notice that the bowl of the e is quite small – tucked in the top box only. For letters with ascenders (stalks that go above the line) (L ) the extra height is just less than the height of the body of the letter – one and a half of our boxes will be perfect. The letter T just peeps above the line, and the crossbar is on the line, the full width of the box. It looks more attractive if it peeps out a little to the left of the downstroke too. When you’ve practiced them in boxes, rule a pair of lines 2cm apart and practice writing the letters between the lines (with L and T going above the top line). I’m going to suggest that you follow the RULE OF FIVE. This says that it’s not worth practicing any single letter more than 5 times in a row, because it’s unlikely to improve by excessive repition. If a letter is giving you trouble, it’s much better to practice it as part of a real word. Tea break! It's beneficial to let things sink in rather than speeding through everything too fast. It's also OK to leave it for a few days and come back - just allow yourself a little reminder of what we've done so far before you move on. Record so far between lessons for one of my learners - 18 months! Do I recommend this? Not really! Now let's have a look at the U family. You should be able to see that the bottom half of the U is following the path of the letter O.
A,G and Q all share both of the curves of the letter O – they need a sharp change of direction in the top right hand corner (unlike the O which is rounded there). Notice how the tail of the Y and G echo the shape of the bottom of the O – they’re not great big curly tails with loops. Like the ascenders, the descenders (tails that go below the line) will look good if they’re about one and a half boxes long. As before, when you’re comfortable with the letters in their boxes, practice them between 2 lines ruled 2cm apart. I’m hoping N,M,H,B and R will all be fine. For P, the final stroke at the bottom of the bowl can either be done by pulling the pencil round as you complete the bowl, or it can be a separate (third) stroke, done left to right, to complete the bowl. Think of K as being just like the H, but with a kink in the final downstroke. I,J and F don’t particularly belong in this family, but shouldn’t pose and problems. Notice how bottom of J and top of F are repeats of the shape we’ve used many times already. It;s a tiny point, but note that the crossbar of the F is just below the writing line, whereas the crossbar of the T is on the writing line. It's not the end of the world if you get this wrong- it just makes F look a little top heavy. Practice in boxes, then between lines 2cm apart. Start thinking of real words to write, because it’s more interesting and better practice to write real words. You've plenty of letters now, so should be able to think of all sorts of words you can write. THE QUAKING BASHFUL HUMDRUM JURY to give this set of letters a thorough practice. Tea break! The last bit of this lesson completes the pencil alphabet - but it'll wait until you've given your brain a rest. The diagonal letters don’t share the SHARK FIN and BUTTER KNIFE shapes, but they do fit into the same size box as the letters we’ve learnt so far. So the letter V, for example, has its lower point exactly half way across the box. It’s common for these letters to end up a little wide compared the the letters we’ve learnt so far, but then they don’t look like they belong. You’ll see there’s an alternate form for the K and the Y here – you can choose which ever you prefer, and even use both in a piece if you wish. The S, like the diagonal letters, fits in the double box but doesn’t quite share any shapes with other letters. Look how it is made in 3 separate strokes, and how it touches all 4 edges of the double box. You know the drill now- practice in boxes, then rule lines 2cm apart! It's all very well being able to write crazy sentences, but what about something you'd like to write? 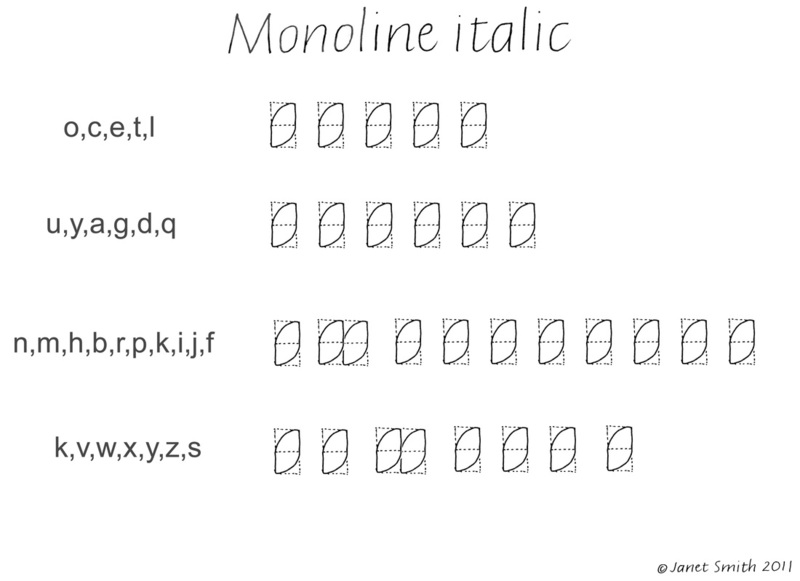 Choose something that you want to write, and set it out beautifully in your new pencil italic letters. Upload your piece so that I get to admire it! A Little bit extra on spacing (see also the article on Spacing in Topics for all learners). When we’re spacing letters in a word, we’re aiming to make the reader’s eye happy that there is equal space between every pair of letters. Now rule a vertical line through all the downstrokes - so there’ll be 3 for m, one for i, 2 for n etc. Well spaced italic means that all these vertical lines are equally spaced (so the space between the n and the i, for example) is the same as the distance between the 2 legs of the n.
So that’s an OK rule for all the letters that have full straight sides (a,b,d,g,h,i,m,n,o,p,q,u,y). But it doesn’t work so well for other letters. Let’s take the word MUTE. If I try and apply the rule, MUT is well spaced, but the E seems to be a bit far away. This is because the eye sees all that space “inside" the letter T, plus the space I left, and correctly spots that it’s bigger than the space between the M and U. So if I want to write the word MUTE with even spacing, the E is going to have to be a little further to the left. How much? Well - let your eye guide you. Trusting your eye and plenty of practice are the way to get your spacing sorted. If this all seems a bit complicated for now, then DON'T WORRY - it'll all be fine !